THE JEWISH TEMPLE WAS NOT UPON "THE TEMPLE MOUNT"! The Dome of the Rock is NOT over the original Temple Site. This is an eye-opening message on the recent discoveries regarding the Biblical City of David, and the original location of both Solomon and Herod's Temples. THIS CHANGES EVERYTHING! Bible Prophecy has turned a new page and things are coming together faster by the day! The City of David - another term for the Jerusalem of ancient times - was located on a narrow ridge south of the present-day Old City. It borders the deep Kidron Valley to the East, where the Gihon Spring, the city’s main water source, is located. The Jerusalem Temple Mount Myth amasses over 200 ancient descriptions which overturn the unsubstantiated tradition that Solomon built his temple at the Dome of the Rock site or anywhere else on the alleged temple mount in Jerusalem. It particularly highlights critical, overlooked descriptions from Josephus which clearly identify this edifice as Fort Antonia--the Roman camp which guarded the temple and which the general Eleazar at Masada said was the only monument remaining after the destruction of 70 A.D. 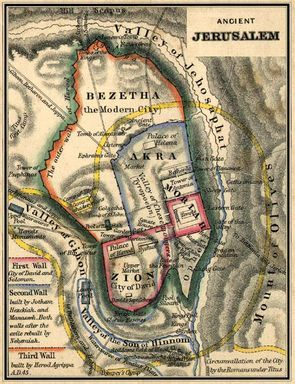 Important descriptions confirm that Mount Zion, a synonym for the temple and its location, was limited to the southeastern hill. Hence, according to Aristeas, the City of David/Jerusalem had its towers arranged in the “manner of theater,” the shape of the southeastern hill, excluding any northerly extension. The Talmud corroborates the boundaries of the city when it mentions Shiloah (the Gihon Spring) stood in the center of the city. Hecateus also locates the temple in the middle of the city and Aristeas tells of an abundant spring flowing under the temple there. Josephus claims the temple was built in the Kidron Valley, which is affirmed by Nehemiah’s description of the temple as the “great tower that lieth out,” near the water gate, which gave access to the Gihon Spring, just north of the royal palace. The account of Jossipon also mentions the Kidron Brook could be seen from above, immediately adjacent to the east wall of the temple. Byzantine pilgrimage accounts affirm they believed the 36-acre walled edifice was the Praetorium and that the Church of St. Sophia stood over the Dome of the Rock, while Eutychius declares the Christians did not build any church over the temple ruins. The pilgrims describe the temple ruins as near the waters of Shiloah. The beginning of the temple mount myth is traced through the later Byzantine and early Crusader accounts. Two chapters on the archaeology of the “temple mount” and the City of David compare the written histories with the remains on the ground. The results certify the correct interpretation of Christ’s prophecy that not one stone of the temple would be standing upon another, a stark contrast to the myth consisting of 10,000 Herodian stones, now called the Jerusalem temple mount. In a book that is being heralded as an “investigative masterpiece,” TEMPLE, by Robert Cornuke, presents evidence that Solomon’s Temple was never built on the Temple Mount in Jerusalem, rather, approximately a quarter-mile south in the City of David on land controlled by Israel. Cornuke, president of the Bible Archaeology Search and Exploration (BASE) Institute, has participated in over 50 expeditions searching for lost locations described in the Bible. He states, “After several years of research sparked by the writings of the late Dr. Ernest L. Martin, personal investigation, and the study of ancient documents, I have come to the conclusion that the temple built by Solomon was not located where tradition teaches. There is no place that is considered a more significant as well as volatile, piece of real estate than the Temple Mount. Some say that World War III will erupt there. More blood has been shed over disputes of ownership and control of the traditional temple platform than any other location on earth. But some now believe the temple of Solomon was never even there at all, and that the legend of it being at that spot has gone unchallenged for so long now that tradition seems to have sealed reality into a long forgotten tomb. Like so many, I thought that the location for the temple of Solomon had been proven to be on the traditional Temple Mount in Jerusalem. But, I became suspicious after reading the work of the late archaeologist and author, Dr. Ernest L. Martin. My research efforts would not have been possible without his ground-breaking insights. However, I hope that my own personal research presented herein offers a bold new chapter in this potentially history-adjusting subject. Jesus warned His disciples of the coming destruction of the temple and that not one stone of the temple would be left on top of another. Matthew 24:1–2 says, “Then Jesus went out and departed from the temple, and His disciples came up to show Him the buildings of the temple. And Jesus said to them, ‘Do you not see all these things? Assuredly, I say to you, not one stone shall be left here upon another, that shall not be thrown down.” Christ’s words clearly state that the entire temple, each and every stone, would be dug up, dislodged, and tossed away. It is interesting to note that there are massive stone blocks by the thousands set in the wall supporting the Temple Mount platform. Was Jesus wrong in His prophesying that not one stone would remain standing? Historian Flavius Josephus wrote that the entirety of the temple was indeed in total ruin and destruction after 70 AD. He went on to say that if he had not personally been in Jerusalem during the war and witnessed the demolition by Titus of the temple that took place there, he wouldn’t have believed it ever existed. Josephus (Jewish Wars, VII, 1.1) speaks of widespread destruction in all Jerusalem as well. So, if the Temple was completely destroyed to the last stone being toppled over, what is, and was, the huge stone fortress we see today rising over Jerusalem? I believe, as do others, that it once was the Roman fort occupied by the mighty Tenth Legion (Legio X Fretensis). I also believe that the true site of Solomon’s temple is about a thousand feet south of the temple mount in the City of David. This would mean that Jesus was correct in His prophetic words and that each and every stone, to the last one, was thrown down. The garrison of Fort Antonia in Jerusalem was as big as several cities, according to Josephus, housing approximately 6,000 men plus the needed support staff. All told, as many as 10,000 personnel served there. But this huge fort has never been found in Jerusalem by archaeologists. I feel that the reason archaeologists have not found the mighty Roman fort is because the tradition of the Temple Mount complex being the temple site has blinded them. Three thousand years ago, the City of David was about 12 acres in size and had an estimated population of only around 2,000 people. It is a finger of land just south of the present traditional Temple Mount. As a former policeman, I would like at this point to lay out a linear case for the City of David as the one and only place for the temple, but first must present a brief history. The Jebusite fortification was a fortress, albeit a small one, but it had what David wanted. It was strategically situated, with a high walled castle-looking complex rising majestically from the Kidron Valley. A spring flowed abundantly inside with clear, pure water, which made it even more desirable. “You shall not come in here; but the blind and the lame will repel you,” thinking, “David cannot come in here.” Nevertheless David took the stronghold of Zion (that is, the City of David). Now David said on that day, “Whoever climbs up by way of the water shaft and defeats the Jebusites (the lame and the blind, who are hated by David’s soul), he shall be chief and captain. “Therefore they say, “The blind and the lame shall not come into the house.” Then David dwelt in the stronghold, and called it the City of David. David took control of what the Bible calls the Stronghold of Zion (Metsudat Tsion), that is, the City of David. These last two locales (Stronghold of Zion and the City of David) are the huge keys to solving the riddle as to where the true temple is located. But to keep on a straight path regarding the true temple site, let’s go back to David capturing the City of David from the Jebusites. After he was in his newly taken fortress, David was visited by an angel of the Lord that pointed out the desired patch of real estate within the city walls that David was to purchase from Araunah (Ornan) the Jebusite (2 Samuel 24:18–25). This land purchase was for a threshing floor—usually comprised of a level area paved with flat stones where grain is tossed in the air and the wind carries away the lighter chaff (worthless husks of broken straw) and leaves the heavier kernel of wheat to fall on the threshing floor. It is interesting, that David had captured the 12-acre fortress by force, yet God was now ordering David to pay money to the Jebusite owner for a threshing floor. But this comment in Scripture is a huge clue for the temple location. In 2 Chronicles 3:1 we read: “Now Solomon began to build the temple at the house of the Lord at Jerusalem…at the place that David had prepared on the threshing floor of Ornan the Jebusite.” This verse conclusively says that the temple will be built in the strict boundary of the City of David at the place of the threshing floor bought from the Jebusite. That can only be in the City of David, and this makes it impossible for the Temples to have been on the Temple mount. Over time, the temple was built by Solomon in the City of David, but it was destroyed by the Babylonians in 586 BC, only to have other successive temples rebuilt with far less grandeur, finally ending with Herod building his temple which Christ actually visited on many occasions. Herod’s temple was destroyed, just as Jesus predicted, down to the very last stone. As time passed, no one knew where the completely destroyed temple really was. And since the Stronghold of Zion was in the City of David, Zion had vanished as well. For almost two millennia, Zion and the City of David laid silently together, buried in a forgotten tomb of earth. When the City of David was missing, and respectively so was Zion, scholars and worshipers in the middle ages looked to the most attractive feature in Jerusalem as a potential candidate site for their lost temple. The impressive high-walled fortress of the Dome of the Rock was the most impressive structure that was still standing in Jerusalem, so some assumed it must have certain historical prominence—and that prominence was the temple itself. Even though many still argued as to where the true temple site was, a Benjamin Tudela (1169) proclaimed emphatically that the Muslim Haram al- Sharif, the current traditional Temple Mount platform, was the proper placement of Solomon’s temple. If I take the words of Eusebius and assemble them into a paraphrased short paragraph it would read as follows: Zion is the place of the temple, the Holy of Holies as well as the Altar. Everything there was shaken down and subsequently ruined. The scattered stones from the ancient destroyed sanctuary (in Zion/City of David) were all carried away and made into secular structures demeaning to God. 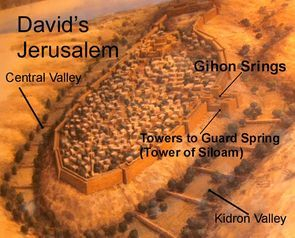 2 Samuel 5:7: “Nevertheless, David took the stronghold of Zion (that is, the City of David).” Zion is undoubtedly within the City of David. Joel 3:17: “So shall you know that I am the Lord your God, dwelling in Zion My holy mountain.” “My holy Mountain,” (temple) is, without question, in Zion within the City of David. Joel 2:1: “Blow the trumpet in Zion, and sound an alarm in My holy mountain!” “My holy mountain” is the temple in Zion. Psalm 132:8,13: “Arise, O Lord, to Your resting place, You and the ark of Your strength…For the Lord has chosen Zion; He has desired it for His dwelling place.” The “ark of Your strength” is the Ark of the Covenant. The temple will house the ark in prophecy and Zion is God’s chosen place for that, as well as the temple placement. Psalm 2:6: “Yet I have set My King on My holy hill of Zion.” The word King is for Christ in this verse, and holy hill is the temple location in Zion. Psalm 102:16,19: “For the Lord shall build up Zion…For He looked down from the height of His sanctuary; from heaven the Lord viewed the earth.” Zion and sanctuary/temple are the same location. Isaiah 2:3: “Come let us go up to the mountain of the Lord. To the house of the God of Jacob…For out of Zion shall go forth the law…” Mountain of the Lord,” is the temple at Zion. Isaiah 24:23: “For the Lord of hosts will reign on Mount Zion…” This is Christ reigning in the temple at Zion. Psalm 20:2: “May He send you help from the sanctuary and strengthen you out of Zion.” Sanctuary is the temple at Zion. Psalm 9:11: “Sing praises to the Lord, who dwells in Zion!” The Lord dwells in the temple at Zion. Joel 3:21: “For the Lord dwells in Zion.” He resides in the temple at Zion. Psalm 65:1,4: “Praise is awaiting you, O God, in Zion… We shall be satisfied with the goodness of Your house, of Your holy temple.” The holy temple is at Zion. Isaiah 66:20: “‘…to My holy mountain Jerusalem,’ says the Lord, ‘as the children of Israel bring an offering in a clean vessel into the house of the Lord.’” “My holy mountain” is connected to “the house of the Lord’s temple” (see Joel 3:17 previous page). The temple is self-evident as being in Zion. 2 Chronicles 3:1: “Now Solomon began to build the house of the Lord at Jerusalem…at the place that David had prepared on the threshing floor of Ornan the Jebusite.” This verse conclusively says that the temple will be built in the strict boundary of the City of David which was the same boundary of the Jebusite city. Zion is the place which links everything together. It is the flaming arrow of all clues that flies directly at the heart of the City of David and the true temple location. 1 Kings 1:38–39: “So Zadok the priest, Nathan the prophet, Benaiah the son of Jehoiada, the Cherethites and the Pelethites went down and had Solomon ride on King David’s mule and took him to Gihon. Then Zadok, the priest took a horn of oil from the tabernacle and anointed Solomon….” The Bible is actually saying here that Solomon was taken to the Gihon Spring and at that very spot the priest enters the tabernacle that held the Ark of the Covenant and gets oil to anoint the newly crowned king.” The tabernacle, with the ark in its hold, was at Gihon Spring in the City of David at Zion. I believe this event happened at the same Gihon Spring where David set the tent tabernacle in very close proximity to the threshing floor area. David’s tent stood for some 38 years housing the Ark of the Covenant until Solomon moved the ark up to his newly built temple, which was more than likely located side by side with the Ophel mound area at the Gihon Spring. The Ophel is translated in the King James Version as the stronghold, the same word used in 2 Samuel 5:7. The City of David was rediscovered in the later 1800s and its walls begin at about 600 feet south of today’s traditional Temple Mount/Dome of the Rock. I found that the Bible further states, “So shall you know that I am the Lord your God, dwelling in Zion My holy mountain” (Joel 3:17). This is reflective of the verse which reads, “My holy mountain Jerusalem…as the children of Israel bring an offering in a clean vessel into the house of the Lord” (Isaiah 66:20). These verses indicate that “My holy mountain” is the same as “the House of the Lord,” which is synonymous with the temple. Since the threshing floor is the site of the temple, which is in the City of David, as well as the true place of Zion, it seems all three converge and solidify in logical summation, as well as logical submission, that the true location of the temple needs to shift to its proper and original site—south of the traditional Temple Mount. 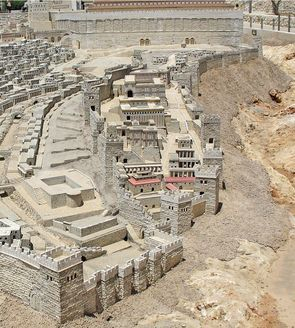 Micah 4:2–13 gives a further prophetic picture of the temple being located on the threshing floor in the City of David. From the Oxford Study Bible (OSB), let me seam several verses together to make that point: In the days to come, The mountain of the Lord’s house Will be established higher than all other mountains; The Lord will bring their King on Mount Zion They do not know the Lord’s thoughts or understand His purpose; For He has gathered them like sheaves to the threshing floor; Start your threshing you people of Zion. The “Lord’s house” (as referenced above) is the temple itself. 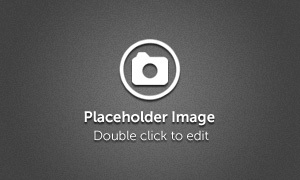 So we have another non-retractable connector with the temple, Zion, and the threshing floor. Once again, the threshing floor (see 2 Chronicles 3:1) is all important in identifying the temple location. Its connection to Zion, in the City of David, adds to the corroborative evidence of the true temple location. According to the Bible (as referenced previously in 2 Chronicles 3:1), the threshing floor is, in effect, the anchor point for the temple. It was in the area of the Gihon Spring. It also seems to be close to where the angel of the Lord stepped in to abort Abraham’s attempt to sacrifice his son. A future judgment will occur on this ancient, missing threshing floor where a new temple will be built. It is where Jesus will rule and reign. This judgment will be the separating of the wheat (those who are forgiven) and the chaff (those who are not forgiven). In Matthew 3:12 we read a chilling foretelling of this fact: “His winnowing fan is in His hand, and He will thoroughly clean out His threshing floor, and gather His wheat into the barn; but He will burn up the chaff with unquenchable fire.” In this verse, the barn represents heaven—a perfect destination. However, according to Scripture, if you are a person who rejects the Lord, then you are essentially…toast!